The Corsican Brothers (French: Les Frères corses) is a novella by Alexandre Dumas, père, first published in 1844. It is the story of two conjoined brothers who, though separated at birth, can still feel each other's pains. It has been adapted many times on the stage and in film. The story starts in March 1841, when the narrator travels to Corsica and stays at the home of the widow Savilia de Franchi who lives near Olmeto and Sullacaro. She is the mother of former conjoined twins Louis and Lucien. Louis is a lawyer in Paris, while Lucien clings to his Corsican roots and stays at his mother's home. The brothers were separated at birth by a doctor with his scalpel. Despite being separated, Louis and Lucien can still feel each other's emotions, even at a distance. Lucien explains he has a mission to undertake, with reluctance. He has to mediate in a vendetta between the Orlandi and Colona families and invites the narrator to accompany him and meet the head of the Orlandi family. 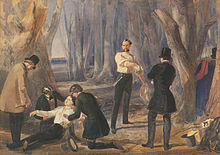 The play The Corsican Brothers, by Dion Boucicault, based on the story, was first seen in 1852. The Corsican Brothers (1941), starring Douglas Fairbanks, Jr.
G.I. Joe: A Real American Hero characters Tomax and Xamot are twin brothers described as having "Corsican Syndrome" in that they share a psychic link and can feel each other's pain. In the U.S. television science fiction series Warehouse 13, "The Corsican Brothers' Vest" is an artefact which causes who ever hurts the wearer to feel the pain (and get wounded) instead of him. In episode 24 of season 2 H.G.Wells' character wears the vest and, when being shot, the shooter gets the bullet instead. In Dear Bill, the parody of British political life during the Thatcher era, Denis Thatcher routinely refers to the government's PR consultants Saatchi and Saatchi as "The Corsican Brothers". In 1970 US television, a comedic parody aired on the television sitcom Bewitched. In the episode titled "The Corsican Cousins", Samantha's mother, Endora, places a spell on Samantha so she will feel and act out everything her cousin, Serena does. In the 1981 novel The Xanadu Talisman by Peter O'Donnell, Georges and Bernard Martel are compared to the Corsican Brothers because "one was good and one was bad". This page was last edited on 21 April 2019, at 10:32 (UTC).